This was the headline of a major newspaper’s coverage of the surge of women in flyfishing recently. And as much as I loathe that title — women have been flyfishing since, well, forever — I learned in the last few weeks that maybe it was apt, if comically naïve. I spent the last two weekends at flyfishing shows in New Jersey and Atlanta, where I met dozens of industry leaders, guides and lodge owners, creatives and rod builders, apparel designers and shop owners. I was representing The Flyfish Journal, and engaged in great conversations with hundreds of great people at both shows — people who wanted to know about the magazine, about where I’ve been fishing, about how Mt. Baker has been skiing, about steelhead numbers in the Pacific Northwest, about the great fishing on the East coast and in the South. This was a reoccurring issue, one that eventually got so annoying that I stopped politely laughing it off as an innocent inquiry from guys who maybe aren’t entirely aware that women do actually fish. In all, I was asked probably 15 times if I *actually* fish while in New Jersey (interestingly, no one asked me this question in Atlanta). That emphasis is not misplaced, either — every time I was offered this as a conversation starter, it was accompanied with a notable inflection on the “actually,” which by the 10 or 11th occurrence made me damn near lose it. Suggestion: For those keen on not insulting the person you’re talking to at the very beginning of the conversation, I’d suggest alternatively starting with “where do you like to fish?” which leaves the other person with the opportunity to say, “well I’ve been loving so-and-so river lately,” or “oh, I don’t fish.” Though when you’re attending a flyfishing show, you should maybe just assume anyone behind a booth probably flyfishes. This was seemingly innocent, but hinted at a larger misconception that is nonetheless incredibly misguided: that women at a flyfishing show — some of the most qualified people in the industry, women who own companies and work for nonprofits and as guides and designers and in any number of other roles — would be not just interested but able to come work for a couple dollars over minimum wage cleaning sheets at your lodge. This man said he’d asked 15 (his number, not mine) other women, and was genuinely surprised that no one was interested. Suggestion: Before talking to a woman or asking her a question (I know, scary stuff) consider if you might ask the same thing of a man at a flyfishing show. I highly doubt that any of the men running booths this weekend were asked if they’d like to come be a housekeeper at a lodge. So there I was, super excited about my comfortable new FisheWear leggings, when an old dude shared this cringe-inducing thought with me, amidst an innocent conversation about how the show had been going for him (he was running another booth). He even gave me a little look over as he said this, while standing unusually close to me. Ick. This one has a few different levels of weird to it. Not only was I asked if I was giving out kisses while sitting behind The Flyfish Journal booth, but the guy who asked then pointed to his embarrassed kid, insinuating that it wasn’t him that wanted the kiss but his preteen. I said I wasn’t really in the habit of kissing 12-year-olds. He was insulted that I said no and thought his kid was 12 — he’s 14, come on. He then said he for sure thought I was 17, which is why he thought it was okay. For the record, let me count the ways that this isn’t okay: Teaching your kid that it’s cool to ask random women for kisses, and being insulted when they say no; using the word “sweetheart” when talking to literally any woman besides your girlfriend, wife or daughter; telling me I look like I’m 17 when I’m 26 and very clearly working professionally in the industry; and, of course, asking random women who are trying to work for kisses. Suggestion: Come to the booth and introduce yourself. Ask me about the magazine, maybe look through one, ask me what I do for them — I’ll likely ask you what you’ve been fishing for lately and give your kid a sticker. Engage with me in the same way you would with the men in the booths around me, and maybe show your kid that women are capable of more than just giving out kisses. Yup, someone had to ask me to sit on their lap, right? This was said with a definitive lap slap, like what your grandpa did when you were five and he wanted to tell you a story. Except I’m 26, this guy was for sure not my grandpa, and he just wanted to get a photo with me. In what has become a common theme in stories of this nature, I questioned whether or not to write this, let alone post it on the internet. 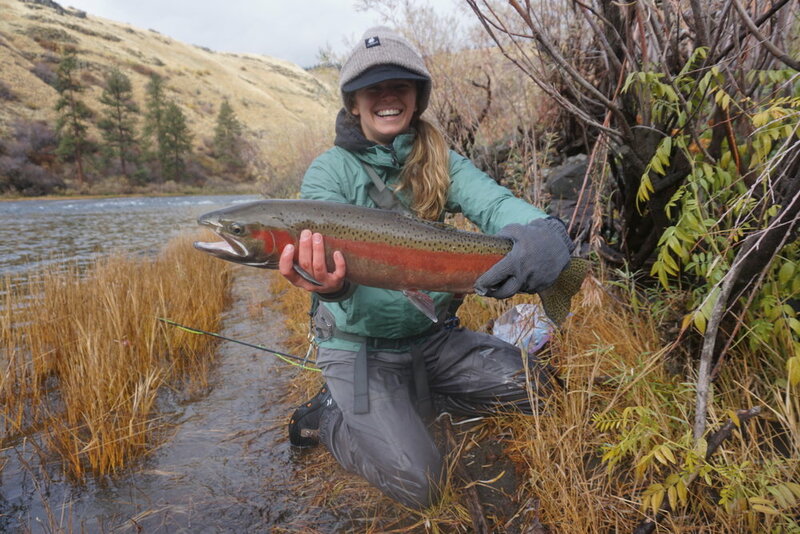 But women in the flyfishing industry (and the universe, really) have been dealing with stuff like this for as long as they’ve been around, so I figured if nothing else, my experiences would be relatable to half the population and informative for the other half. The vast majority of the men I spoke to over the weekend were respectful, tactful and thoroughly interested in hearing about my favorite rivers, my experience catching my first steelhead last fall and the work I’ve done for The Flyfish Journal. And then there were the handful that were peddling that same old attitude towards women in this industry, even though in most cases, these conversations could have been positive if just an iota of thought had been put into them, which is frankly not that much to ask. Even if some of these interactions read as innocuous — maybe misguided but innocent nonetheless — they were insulting, blatantly sexual and, ultimately, detrimental to an industry intent on welcoming all of us recently “discovered” women. This guy did not ask me to sit on his lap. Be like this guy.